It’s that busy time for developers again… are they all preparing for holidays and cleaning the house? 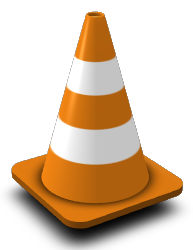 VLC player is now at stable release 1.1.10 – apart from bugfixes and codec updates, this is also a security update (no known CVE number yet) so everybody is enccouraged to upgrade his installed version. Get Slackware packages from my repository or one of its mirrors. And remember, if you need to encode mp3 or aac audio (there is no functional difference in decoding audio between all my packages) you need to grab the package which is inside the “restricted_slackbuilds” directory. Patent trolls prevent me from hosting those packages in the US on slackware.com. Posted: 6 June, 2011 in Slackware, Software. Thanks Eric. Outstanding, as usual. i use LXDE compiled on your slackbuilds and if I upgraded slackware to 13.37 there was strange delay sometimes to 30 second in coping,delating files until they disapear in pcmanfm window or desktop. This strange behavior causing gamin configure file . In 13.1 there was no config. @George , I would say, install and try it out! VLC was conceived to be able to play any media without having to depend on external “codec packs” like is the case with MPlayer. I dislike the concept of the “codec pack” since it is not clear where these codecs are coming from and in how far their use is legal. On the other hand, I am able to compile every open source codec into VLC. I started (compiling and) using VLC because MPlayer was unable to display DVD navigation menus and the developers stated that that was very hard to implement because of unfortunate earlier design decisions they made. On the other hand, VLC not only allows me to use DVD menus, it also plays my local music, and the internet radio stations I listen to. It also has a nice GUI with a lot of options. Plus, its development process is a lot cleaner than that of MPlayer. Had a couple of little problems building vlc 1.1.10 on Slack13.37 x86_64. Note – I am logged in as root to build vlc. 2/ Three of the patches failed. Didn’t seem to cause any problem and I didn’t investigate further. patch-vlc.log:9:Hunk #1 FAILED at 67.
patch-vlc.log:20:Hunk #1 FAILED at 4767.
patch-vlc_dc1394.log:9:Hunk #1 FAILED at 185.